Over the last few years, construction projects have become more sophisticated and complex, while the limited areas available for urban construction have led to increasingly higher buildings. In 2018, UPB finalised two high-rise building projects: the 17-storey Gamlestads Torg office building and the 15-storey Regionens Hus office building. Active construction work is currently underway on our project Gårda Vesta, which will reach 25 storeys in height, and Stockholm New, which will be the tallest UPB building to date. The Stockholm New office building will be 28 storeys and 110 m high. With 2000 t of metal used for its frame alone, the building will span a total of 25,700 m2. Within the project, UPB is designing, manufacturing and installing the metal frame and reinforced concrete constructions. The installation work by UPB will take 52 weeks. 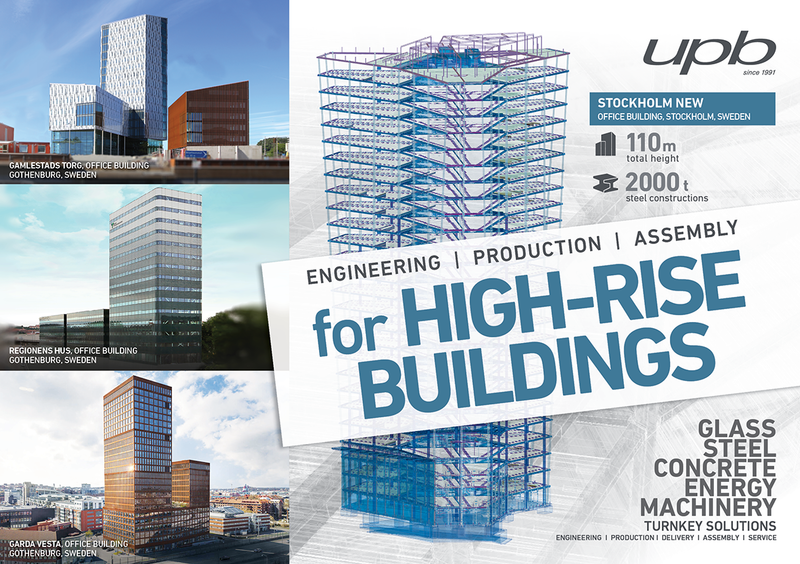 Furthermore, UPB has very recently started designing a 36-storey office building in Gothenburg, Sweden.